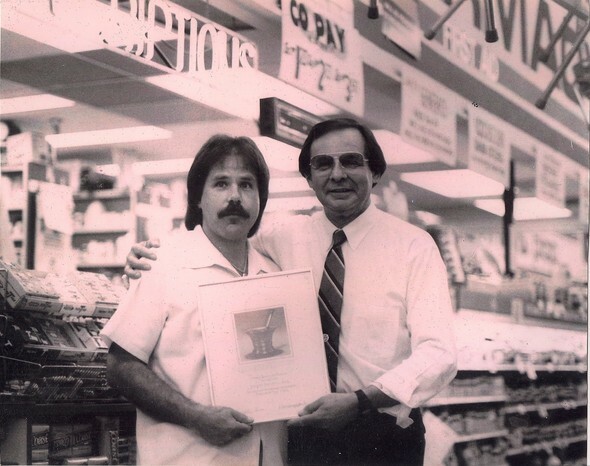 Posted on Fri, Jan 13, 2012 : 5:59 a.m.
Milton 'Mickey' Mindell, founder of Mindell Pharmacy, which operated on Carpenter Road for 28 years before closing in 1996, is pictured here in 1985 with his son, Michael, at the pharmacy. Milton “Mickey” Mindell, owner of the former Ann Arbor area Mindell’s Pharmacy, was not only passionate about running a drug store. He also loved forming relationships with those who frequented his store and he never forgot a name, said his son Michael Mindell. Mickey Mindell, a resident of West Bloomfield, died Jan. 1 at the age of 84 from lymphoma. “Everyone in the family was by his side when he passed away in the nursing home,” Mindell said. Mickey was born in Detroit on July 28, 1927 and after graduating high school, he decided he wanted to be in the Navy. Mickey opened up Mindell’s Pharmacy in 1968 and it was located at 3140 on Carpenter Road near Packard where stores such as Home Goods and T.J Maxx are now housed. Mindell said the business closed in the 1990s after 28 years. “The landlord at that property decided that 28 years into the 30 year lease that he would rather have Arbor Drugs as a tenant and without asking us, he gave our lease to Arbor Drugs and didn’t give us an opportunity to renew,” Mindell said. “Arbor Drugs wanted to buy our store and we wouldn’t sell it to them and they went to landlord and said ‘I want that store’ and I got that call from our landlord two years before the lease was up and he said ‘that’s it.’ We would still be there today had he given us the opportunity to renew our lease." A few years later, CVS Corp. acquired Troy-based Arbor Drugs Inc. for $1.48 billion in stock, according to the New York Times. Since Mindell's death, community members have recall memories in an online memorial guestbook — and each one recalls his kindness and sincerity. Bruce Kutinsky, who is also now a pharmacist, said much of what he knows came from working under Mickey. Kutinsky began working at the pharmacy with his uncle Mickey at the age of 12. “Mickey was my inspiration to become a pharmacist,” Kutinsky said. Kutinsky said Mickey was known not only for being a “master of merchandising” but for his impeccable customer service. Mindell said he learned invaluable lessons from his father. Many have asked how they should go about showing their appreciation and gratitude to Mickey and Mindell said his father would have only wanted one thing. Mickey is survived by his wife Rita; his three sons, Michael, Allan, and Seth; seven grandchildren; his brother Bernard; brother-in-law Edward Pollak; and many other family members. Katrease Stafford is a freelance reporter for AnnArbor.com. Wed, Feb 22, 2012 : 6:35 p.m. I just belatedly got the news about Mickey's passing, and had to say a few things. I worked for him some 40 years ago in Ann Arbor while attending EMU and, looking back, it's something I'd have done for free. Mickey, his staff and his customers were a family, and a LOVING family at that. I couldn't wait to get there in the morning, and never wanted to leave. My professional life since then has mostly been in customer service, and I'm considered to be as good as it gets at people contact. If that's true, it was born at Mindell Pharmacy. Thank you, Mickey. LOVE YOU, MICKEY. See you again some day. Thu, Jan 19, 2012 : 4:56 a.m. This was sad to hear but what long lasting memories of having my first job. He gave me a chance by moving from their small store on carpender to the larger store, it seamed so huge at the time. So much was learned there. He was so nice to several of our family that had worked there. He was a GREAT example of how you should treat others, no matter who or how they look. I still try everyday to be that way. Thanks Micky and Mike! Your family will be in my prayers. Brian England. Sat, Jan 14, 2012 : 7:43 p.m.
Fri, Jan 13, 2012 : 9:07 p.m. Thanks for the walk through memory lane. A great man, and I'm sure he didn't realize how many lives he affected in such a positive way. My prayers go out to his family. Fri, Jan 13, 2012 : 8:13 p.m.
Mr. Mindell use to own a Pharmacy on the 1960's on Packard near Platt Road called Mindell's Pharmacy. Right next to Kelsay's Meat Market. Right next to the Honda shop on Platt Road across from Busters food Mark. This was way before he moved to Carpenter Road. Fri, Jan 13, 2012 : 9:04 p.m.
Fri, Jan 13, 2012 : 5:13 p.m. I remember this store fondly, A trip over there involved a walk though of Best products, and the over to Mindell's. He was quite the merchandiser, they had some great stuff in stock for kids. Fri, Jan 13, 2012 : 4:18 p.m. I'm so sorry to hear this. I've mourned the loss of Mindell's so many times, and now the loss of Mickey. He was a wonderful guy and so comforting when there were health problems in the family. R.I.P. Mickey, and my sympathies to the family. Fri, Jan 13, 2012 : 2:08 p.m. It was the best store, he had everything you can imagine and served it with a smile. Years later I've ran into him and he remembered me. To honor him do something kind to some one else. Fri, Jan 13, 2012 : 1:28 p.m. I'll always remember my treks up to Mindell's as a child in search of candy or baseball cards. The place was an institution in the East Ann Arbor area. Mr. Mindell and his son Mike were always smiling and friendly and always tried to develop friendships with their customers. The ran their business the old fashioned way. Their personal style of interacting with customers was old school. We could use more businesses that care about their customers like Mindell's did. RIP Mr. Mindell. My memories of your store will always be with me. Fri, Jan 13, 2012 : 8:06 p.m.
Fri, Jan 13, 2012 : 4:42 p.m. Agreed, I can always remember asking my dad to take me up there for baseball cards! A place I will never forget. Fri, Jan 13, 2012 : 1:34 p.m. This was our favorite place to go to get candy when we were little too! We'd either walk or ride our bikes up there. Such great memories... RIP Mr. Mindell! Fri, Jan 13, 2012 : 12:44 p.m.
What a great store -- it had everything. It was the Schlenker's of pharmacies. Fri, Jan 13, 2012 : 12:41 p.m. I liked going to Mindell's. Micky was very kind to me. I got the kind of customer service that is unknown to customers today. He gave me a cup of water one time when I was coughing a lot (asthma) and I appreciated that kind act. Now you go to a pharmacy you only see the clerk who checks you out behind the cash register. This was not true for Micky. Prayers to his family! Fri, Jan 13, 2012 : 12:40 p.m.
Fri, Jan 13, 2012 : 12:32 p.m.
Mindell's was a great pharmacy. Customer service was a priority. It had a cozy, home-town atmosphere. No one was pleased when they closed. Thank you, Mickey, and the Mindell family for the services you provided us for so many years! Fri, Jan 13, 2012 : 12:30 p.m.